The RAF Halton Radio Society was started in mid-2013. There had previously been a Radio Club at RAF Halton but this had closed many years before. The new Club now has the use of a large room on the Station and is open most Saturdays and on occasions at other times. New members are always welcome and do not necessarily have to be RAF or ex members of the RAF. The Society Station is a permanent Airfields on the Air Station and is on the air most Saturdays. The Club is a Registered Exam Centre and holds Club Membership with the Radio Society of Great Britain. A Foundation course has just been completed with excellent results. A Intermediate Course will be starting very soon. There is plenty of space in the Club room for operating positions and member’s projects. After the success of using GB100RAF to commemorate 100 years of the Royal Air Force, the Club is looking at the possibilities of using another Special Callsign to mark 100 years of the existence of RAF Halton. Watch this space for more information. Details of how to contact the Club can be found on the Contacts page, select Matters concerning Affiliated Clubs or use the message form. Select this link to go to the page. A quite day at the Club, no doubt Easter had something to do with this. Dave G0KUC was first on the scene with Tony BBZ turning up for a while later. Jon JKV popped in for a few hours and spent some time with Dave using FT 8. There is currently a series of Special Spanish Stations on Air using AM70 series callsigns to mark 70 Anniversary of the Spanish Radio Amateur League. Dave has been chasing Stations for an Award and is doing very well. The Club is also having a go and was in 108th position on Saturday. Dave Finished the Day with a couple of Contacts to Japan. A while was also spent checking out a loaned G5RV which looks in good nick and is full size. Will come in handy for using around the Station as part on the 100th Anniversary of RAF Halton. Ofcom have now confirmed that the Special Special Event Callsign GB100HAL may be used at Halton to mark one hundred years of RAF ownership. A separate page is being set up to let you know what is going on. It started today as a usual Saturday morning with Tea and toast. The 4 early birds to the club had a group of 4 visitors escorted by Derf the vice Chairman of the Club. Two of the visitors had literally flown into RAF Halton arriving on Friday after a two day marathon Paramotor flight. Giles Fowler and Paul Mockford, ably supported by fellow pilots and ground support Katie Pagett and Andy Greaves, attempt to fly over, or land at, at least 40 former or current RAF airfields over two days. A 263 mile navigation and endurance marathon starting at the former RAF Goxhill in Humberside and finishing at RAF Halton in Buckinghamshire. Their aim was to raise funds for the Royal Air Force Association. The rest of the day was spent trying out a 2TFD short antenna, but it did not perform as well as the G5RV on the lower frequencies. The aim is to find a suitable second antenna so both FT8 and HF voice can be used at the same time. Dave G0KUC made a dozen or so contacts on FT 8 and HF Voice. The Club is planning to support RAF Halton with its 100 Anniversary celebrations. They plan to run One Hundred events to mark the occasion. The Club has offered to help with putting on a Special Special Event Station. The callsign GB100HAL has been accepted by Ofcom and the Operations Manager awaits final confirmation. Further details will be published on this site, when available. A good turn out today with plenty to talk about over Tea and Toast. Dave G0KUC has had a response from Ofcom regarding the application for a Special Special Event Call sign to mark 100 years of RAF Halton. Whilst Dave is dealing with the application Jon has been working behind the scenes to source a relevant picture. After contacting the Photographic section, he was given a lead that the Apprentice Association are digitising their collection of pictures. All going well and with their approval we should be able to find a suitable picture. As soon as we have confirmation on the event details will be published on this page. A bit of sorting out took place with Derf assisted by Roger moved some of the collection of HF Receivers into a computer cabinet. This has made some space on the table which has various old bits of kit on it. The plan is to free up some wall space so the various awards gained by the club can be displayed. Nick carried on with his repeater project whilst Tony had a go operating as an Air Fields on the Air Station, the Club is a permanent Station for the scheme. Only one contact due to conditions, at the former RAF Yeadon, now Leeds Bradford Airport. This Station had Air Cadets assisting with the operation. The other Tony, G4CJC, and Dave G0KUC tried their hand at operating with FT 8 on 2 metres and then on HF. Nearly a page of contacts made. Tony loaded the latest version of FT8 onto the lap top. Tony writes the 10 Metre page on the Southgate Web site. Not so many in attendance this week as members had other commitments to meet. Derf was at a RAFA Conference, Malcolm and the other Dave were down in Crowborough assisting with an Air Cadet Amateur Radio Foundation at the end of the course 11 Candidates passed and can now apply for their Foundation Licence. Simon came over and did a little operating, joining the RAFARS net and later exchanged a contact with Malcolm at Crowborough. Nick was working on his repeater project. Dave G0KUC hosted two visitors, Jonathan and his wife Alison who were made most welcome. Some contacts on FT 8 on 2 Metres and later made a full page on HF. The usual start was made at the mess table. Over several cups of tea and slices of toast it was proposed that the Club offer to assist with RAF Haltons centenary celebrations. It is 100 years this year since the Rothschild’s sold the Estate to the War Department for use by the fledgling Royal Air Force and was strongly supported by Lord Trenchard who went onto introduce the Apprenticeship Scheme into the RAF. Dave G0KUC was tasked to approach Ofcom to attain a Special Special Event Callsign to mark the centenary. Various options, for a callsign, were discussed and when and where we would operate from on the Station. A good turn out today with 11 members in attendance and one other accounted for. All sorts of activities going on, Derf fitting an aerial to his car, Nick with Mick reprogramming some Tait mobiles and checking them on a test set. A pile of nine finished with the set destined for the Air Cadets. Malcolm went through the Intermediate project part of the syllabus and guided him in the right direction. Derf is reregistering as an Assessor so he can sign candidates off as Mark the other assessor is often away working. Adjustments were made to the 2 metre/70 Cm dual band aerial, raising it a little and changing the coax for Westflex. A successful result as Dave managed 5 contacts on 2 metres. A round up of the operating was 5 contacts on HF by Alain before the conditions dropped off and Dave managed a page of FT8, contacts in Central Europe and the Americas. The usual start of tea and toast whilst the members assembled for the day’s activities. Dave, G0KUC, also showed the assembled members the certificates which he has been collection from various stations around the world. A good turn out today with lots of jobs done. Jon sat his Foundation Exam facilitated by Dave M5AGW down in the Learning Centre as this is an approved examination site. No need to worry about the result in view of Jon’s experience, full marks obtained. The necessary documentation is in the post to the RASGB and Jon should have confirmation in around a week. He is looking forward to getting on the air. Whilst Jon was sitting the exam Dave G0KUC was well into operating FT 8 and by the end of the day he had completed over two pages in the log. Best contact of the day was a Station in Argentina! One of the helpers from the Trenchard Museum on site popped into today. He is a Radio Amateur and he was happy to fill out a membership form and pay up his joining fee. This year marks the 100th year of the RAF at RAF Halton. The club is looking at holding a Special Event Station at a suitable event during the year. The Club is using the Special Special Event Callsign GB100RAF during the period 16 February to 24 February 2019. Most days will be covered at some time or other. The Station kicked off on Saturday the 24th with both SSB and FT8 being used. Conditions were only fair and all was a bit hard going especially with FT8. Derf made about half a page of contacts on 80m and the RAFARS net. Dave G0KUC had a go later in the day and filled up a couple of pages. He reports that he made one CQ call and the stations kept coming in! As the even unfolds more info will be shown here. The recent snow fall may have kept some members away to daybut the hardy turned up. Tea and toast to start the day off. Once the second cup wasdowned the member started on their activities. Mark had a look at an ICOM IC271E which was in the Club and was clearly dead. He will try and bring it backto life. The Provenance behind the set is that it was originally acquired forthe Armed forces just after the Falkland’s War being obtained in a hurry tosupplement the normal issue radios. It ended its life in the South Atlantic asa base station for an Adventure Training Centre being used in conjunction with AmateurICOM handheld’s of the period a mix of models including the IC12 range of handheld’sand IC 228 Mobiles. All these models and may be more were used throughout the Falkland’sand were superseded when Air Wave came along. Most of the surplus kit wastransported back to the UK and found a home with the Air Training Corps.Mutterings were heard from the bench about back up battery and regulators!Hopefully the Club can give it a new lease of life. The picture aside is when the set was last used, the 2006 RIAT. Dave G0KUC joined the morning RAFARS HF Net at 11 00. Jon,listened d intensely to goings on and id looking forward to obtaining his licenceat the next Club Foundation Licence Exam. During the afternoon Dave fired upthe Lap top and kicked off a session of FT8 inviting other members to have alook. It was a challenging session but he made 10 contacts by close of play.Nick, continued with one of his projects for the Air Cadets,servicing some low band VHF Base Stations. The Club is still looking for operators for the next GB100RAF, a week long period between the 16 February 2019 and 24 February 2019. More information will be published soon. Usual start to the Saturday proceedings, tea and toast and planning for the day. Derf installed his Drake linear into the radio ti dy on one of the operating desks, but no RF into it today, may be next week. He also sorted out and packed away his spare parts for his Marconi T1509 which he eventually plans to restore to a working condition.Mark popped in to sort some more surplus equipment for the Rallies coming up and spent some time working on his teleprinter.Mick showed Malcolm how to programme a Motorola GM350 and checked out a programming lead which did not do perform as advertised.Dave G0KUC spent most of the day trying different aerials for the FT 8 set up. Considering the conditions on the day he managed 23 contacts with 4 North Americans and a Brazilian. The remainder were within Europe. As usual the day started with a chat over tea with 10 in attendance. Various discussions took place over tea and toast. A plan for the day was drawn up. Dave G8KUC was on FT 8 duty and was struggling to make many contacts. He check aerials and feeder but no joy. He tried removing the lap top power supply and noticed that some stations were then showing. The issue turn out to be a less than reliable USB port adjacent to the PSU lead. He made several contacts and one was with a RAFARS member who had included his RAFARS number in the FT8 message. Whilst all this was going on Derf G8ZGK worked on his Drake linear which he acquired last year. He has spent a lot of time upgrading brining the new old stock linear amplifier up to date with many modifications. The morning was spent with the amp on the big work bench with his head down doing some fine tuning. Once he was satisfied he powered it up using his 10 watt Elecraft KX3 to supply RF to the beast. With Bird through line and 1 kW dummy load he turned the power up to 400 watts to make sure all was well. It needed a bit of fine tuning which was carried out. After tests with the scope it was put away for the night as Derf would return on Sunday to use a bit more power through his Elecraft 100 wat amp. This produced somewhat more power, heat and a good hum. There were a few Club members there to witness the event and all were well impressed.Later in the day Mark, the New Chairman, arrived and together with Malcolm made some space on the computer tables to allow the IT team to come in on Sunday to connect computers and printers up. They would also check the system out, it had not been used for many months due to the move of location. A lot done today, first off, Dave GOKUC reviewed the GB100RAF QSL Cards he had just received. Whilst he was doing this the club members enjoyed their breakfast of Bacon Rolls, Tea and Toast. A quick go on the RAFARS Net followed by setting up a Data Station. Before long Dave had FT 8 loaded on the lap top and was on the air using an FT897 with a temporary vertical Hustler aerial. An encouraging start once the ATU was changed for a manual one. A couple of Russian Station started proceedings with a few other Station in the bag before we had to close for the day.Gemma and Mark continued to sort through some of or surplus quality equipment and components with an aim to move these on at Canvey and Harwell Rallies. The main object today was to agree what Radio Rallies the Club would attend during 209. I short list was drawn up and a start was made on looking out some of the Clubs surplus equipment and components ready for the first Rally which is planned to be Canvey on the 3 February 2019. This did not give much time for operating but Dave, G0KUC, manged to join the morning RAFARS Net. A good turn out today and that is with a couple of regular faces missing. Seven sat down to bacon rolls at 09 00 and all admired the near complete tea bar. A little more work was carried out on this today and it should be fully completed shortly. Whilst most of the others worked on the tea bar Dave G0KUC fired up the HF set in readiness for the RAFARS morning net. Dave took the opportunity during the net to collect a few more points for the RAF100 Members Contest. Later in the day he was actively chasing other RARARS members to rack up the points for the Club. A very good turnout for the AGM with 11 members in attendance and four apologies received. The AGM was over within 45 minutes and the Minutes will be posted on the Club Notice Board when ready. After the meeting there was a short discussion on a few topics the main one being the application to use GB100RAF again in the New Year. This has already been approved and will take place from the 16th to 24th February 2019 inclusive. If you would like to come along and assist please advise accordingly. No doubt Dave G0KUC will be chasing members. For the rest of the day the Cadet Staff spent time sorting equipment and planning for next year. Dave spent a challenging afternoon trying to make contacts. Not a lot of luck just five continental contacts made. The Club Room will not be open on Saturday. The next time it will open is due to be after Christmas, on Saturday the 29 December 2018. No doubt there will be a few mince pies and left over Christmas fair available. 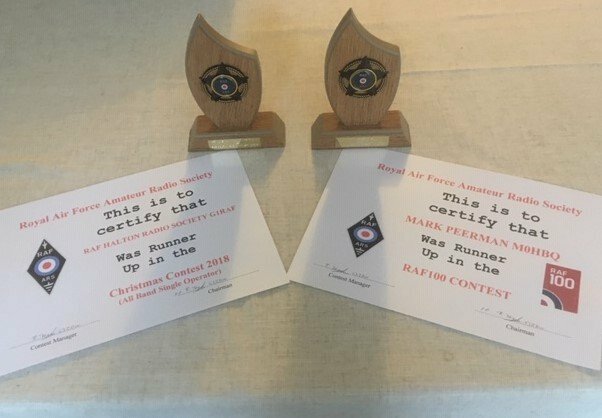 The Club is hoping to put in an entry for the RAFARS RAF 100 Members contest so if you hear us around the bands we would love you to give us a call and exchange reports, serial numbers and RAFARS numbers. There is a plan to have a short spell on the air on Saturday 29th December 2018. A total of 6 members today; Mick, Nick, Mark, John, Roger and Dave, with two other members away on a Radio related activity. A cup of tea and a good natter to start off with. John was sorting out the extension leads, for the desks, followed by listening in to the RAFARS net, only three others on it though. Dave, now has 3 eligible contacts with serial numbers for the RAF 100 members contest. Mark helped Roger sort out power cables for his rig to power supply so he can transfer it from car to shack easily. Mick was chatting to Nick about more sets for Nick's collection with good batteries. All were reminded about the Club AGM. This will take place at 10 00 on Saturday 15 December in the Club Room. Dave G0KUC spent the afternoon working stations in between the Italian contest. Dave, G0KUC went to the Club Room today to take part in the RAFARS Contest which took place between 14 00 and 16 00. Another challenging day. He made 7 contacts in the RAFARS Competition but stayed on air after the event to make another 33 contacts mainly from within the UK. A good day on the RAFARS Net, seven contacts on the 11 00 net on 3710. A quite day to day, very little operating as the members were concentrating putting up some shelving, revising the operating area using two new equipment tidies. All starting to look the business after the move of location. Still a little way to go but there is some light at the end of the tunnel. Dave, G0KUC did the lion’s share of operating today as most of the other Club members were busy helping the Air Cadets with a Gold Communications Course. A good page in the log filed with a contact made with F1RAF. He also contacted 10 Latvian Special Event Stationswhich were marking 100 years of existence. A nice certificate has now been received confirming the contacts. A busy day to day with Dave taking the lead with a tally of about 3 pages in the log, 91 contacts! All were European stations with the majority in the UK . The 20, 40, 80 meter bands were used. Several Special Events Station were contacted which were commemorating the end of the Great War, now known as World War 1. Dave also joined the RAFARS Net and updated them on our progress. Some Foundation Licence tuition was taking place with Malcolm assisting Jon. Tomorrow Sunday the 11th will be last day of using GB100RAF at the Club. However, members are talking over the options of applying for it again in the new year! A good day today with 7 members being around during the day. A full day operating GB100RAF on FT 8 with 15 contacts, 52 on Voice and 6 on CW. Noel was on the key performing well, he is an ex Air Force Telegraphist form the days when the RAF was out in Aden. We welcomed a new visitor, Chris who I had not seen for a long time and it was good to catch up with things. We did not operate on Friday but will be back on air on Saturday and plan to join the RAFARS net which is usually on 3710. We have been contacted by Terry who runs the station at the RAF Neatishead Radar Museum, GB2RAF and the plan is to make contact at some time during the day. Today was the turn of Simon and Alain to have a go. Staying mainly on 80 meters with the odd foray into 20 meters they managed a commendable 65 contacts. They were kept busy all day, reluctantly throwing in the towel around 17 30. The fourth main day of operating GB100RAF with Dave G0KUC and Tony G4CJC of Southgate Web site. Tony came along to operate FT8 using GB100RAF. Unfortunately he could not get it to work as the callsgin was to long. Hopefully the software will be adjust with the next release. However, he did use the Club Call G1RAF which proved very successful, with 19 confirm contacts being made throughout the world. Only a few calls made on Voice. Later in the day the other Dave and Malcolm came in to try 5 megs again with the hope of contacting Air Cadet Stations. Again no joy due to the poor conditions. Derf, made special effort to operate on 5 megs this evening hoping to make contacts with Air cadet Stations. Unfortunately the conditions were not good and no contacts were made. The second day with GB100RAF on the Air. Dave G0KUC and Simon were manning the station. Bit of a slow start but things liven up for a while after the morning RAFARS Net. Not as good as Saturday, around 50 contacts on HF with one to the US of A and North Africa. Whilst Simon plodded on with HF Dave had a go on 2 meters and managed about 8 contacts. It may be a late start tomorrow, Monday the 5 November, around mod afternoon. Today was the first day of the Club using Special Event Callsign GB100RAF. Five Club members turned out to assist with operations. The G5RV was quickly erected in plenty of time to join the RAFARS Net on 3.7100. When the net was over the frequency was handed over to the Club and operations commenced with Dave G0KUC, our operations Manager, taking up the microphone for the first session. During this first session contact was made with Alain another club member who will be operating later in the week. After an hour or so Simon took the microphone for the next sting, still on the same frequency and soon clocked up more contacts. Malcolm was the next one to have a go and the contacts continued to pour in. To round off Simon and Dave had another session each. A tally was taken at 16 00 and by then over 100 contacts had been made.Whilst all this was going on Nick continued with his refurbishment programme for Radios for the Cadets, making a start on some low band equipment. The other Dave was kept busy making tea and assisting with setting up a Station for 60 metres which will be used during the week to contact Cadet Stations in the evenings.The Station will be on Air again tomorrow and most days up until Sunday 11 November. It is planned to give regular updates of how things are progressing on this web page. Only two at the Club Room today. All others on other duties with 3 members attending the RAFARS AGM. Mark had entered a PSU he had made for his teleprinters and this was taken along for judging. He attained first place and was awarded the constructors cup. The Club gain two other awards, the Annual Affiliated Clubs contest and the RAFARS Christmas Contest. A hat trick scored and whilst all this was going on Derf and Nick finished of the tea Bar in the Club Room. A busy day rearranging the club room now the tea bar has been finished. Time was still found to do a bit of on Air operating with 8 contacts made, two of which were in the Sates. A good effort by Dave and Tony as they had to compete against several competitions. Tony popped into see what we do on a Saturday as he has volunteered to do some operating, mainly FT8, during the clubs GB100RAF week from Saturday 6 November until Sunday 11 November. Dave the operations managers is still looking for operators to help. Only two members on site today as other had various other commitments, ranging from visiting in-laws and undertaking training for a Day Skippers ticket! Malcolm managed to contact the club, via local 70cm repeater GB3TU on his journey to the in-laws. A good contact from near to Chelverston the location of the old RAF HF Transmitter site. A busy weekend in the Club Room. As well as the usual projects and operating taking the Club Room was made available to the Air Cadets who were undertaking their Gold Communications Badge training. Assisted by their Instructors, all of whom are Club members, they were introduced to the various types of radio they will be using for their assessment. In addition they were given a chance to work with data message sending. A non-Club meeting day but 4 members of the Club, Derf, Malcolm, Jon and other Dave assisted the RAF Halton’s Trenchard Museum with the Cool Aeronautics event. The RAF Associations (RAFA) made their club room available and during the day had visits from 6 groups of Junior School children. This event is part of the STEM project, science, technology, engineering and mathematics. All groups were given an over view of an Airport and its operation. All the participants had the pportunity to operate a hand held radio. A few club members on site for the Club Meeting. Dave G0KUC did a bit of operating with Nick having a look at some test equipment. The other Dave and Malcolm went off to Crowborough Camp, for the weekend, to assist in the Training of some Air Cadets for their Air Cadet Foundation Licence. As a result 13 Cadets and Staff can now apply for their Amateur radio Foundation Licence. A good turnout considering the weather forecast. Seven members arrived around 09 00 and started proceedings with tea and toast devouring a full loaf of bread and half a jar of marmalade with copious cups of tea! Derf spent an hour or so checking out his 5 Racal Syncal 30 HF sets which he has been picking up recently. Not a full worker amongst them but he hopes to get them going again. Mark M0HBQ and Jamie continued with their teleprinter project with Mark putting the finishing touches to his home brew teleprinter power supply. He will be entering this into RAFARS constructor’s competition at the AGM in October. It was looking very smart with the polished aluminium Case. In readiness for the Air Cadet Blue Ham exercise, 13 and 14 October, Dave G checked out a 5 MHz dipole antenna which he found in the store room. A few adjustments were required to get it working where it was needed. Dave G0KUC again put up the 5 RV and started working the bands. Firstly working Terry at Neatishead who was using GB100RAF for the weekend and then joined the RAFARS NET. Later in the day he was working some of the Railways on the Air Special Event Stations up and down the country. May be the Club should register for this event in view of the fact that RAF Halton had its own Railway which brought in coal for the boiler house and other stores. It closed when the boiler house stopped using coal in 1963. At the end of the day there were 20 contacts in the log. Whilst all this was going on test were conducted to establish that the club could use the 5 MHz frequencies whilst using use other Amateur Bands. Test proved very useful indicating what was possible. The club members attendance today was boosted as the Air Cadet Activity Centre at Halton had a Radio Course taking place and most of the Instructors are also Club Members. A grand total of nine in total with a few regular faces missing. Nick continued with his project of refurbishing the hand held radios and managed to programme around a hundred sets. They now need checking on the test set which should be done next week. Dave G0KUC made a few contacts on HF as usual, whilst Derf assisted the Air Cadet Course with the Practical skills section of their Gold Course. This cover such things as propagation, aerials Ohms Law, construction of an Aerial and fixing BNC plugs to coax. During the morning a text was received from Mark letting us know that he completed making his power supply for his teleprinter. After the usual Tea and Toast the G5RV antenna was erected in its usual place. In addition a long wire was put using a SG 230 tuner. Dave G0KUC joined the RAFARS net which had 7 participants. An opportunity was taken to get a comparison between the G5RV and the long wire. On most contacts the G5RV performed slightly better. All were fair workable signals. Whilst all this was going on Nick was checking out a recent purchase, a Field Strength meter and started programming some Hand Held Radios for the Air Cadets. A quite day today, due to holidays and other commitments of Club members. Tea and toast taken at 09 00 with the usual chat and Dave G0KUC producing a QSL Card from 1989 for GB50RAF marking the 50TH Anniversary of RAFARS. Shortly after the G5RV was erected with just a two contacts made, G4PSH and G4XGK in the morning. A little better in the afternoon, with two Japanese Stations and an Asiatic Russian Station in the log. It was tea and toast as usual at 09 00 today and this included some homemade marmalade, thank you Dave M5AGW. Just a few of us today due to the Bank Holiday no doubt. Mark continued with his teleprinter project, doing a few tests with his home brew power supply. He found some WD 40 to use on some components he was having difficult undoing. He plans to let it a week to soak in, if no joy may be a bit of plus gas may help. Nick was getting through a big pile of hand held radios and all we could hear most of the day was a nice Chinese lady saying “power on” as he put the sets through various tests. Dave M5AGW spent some time using the Club library to do some research on data modes, I think he may have dozed off at one stage, so the books could not have been a riveting read! He has taken a couple home and this should cure his insomnia. Malcolm, in the absence of our Operating Manager Dave G0KUC who was resting after a long drive back on Friday from the RAF Waddington Club, put up an 80 foot long wire with the other Dave and had a go at operating. Using the wire through an SG230 Tuner, the RAFARS morning net was joined which had 4 other stations on air, some 5 and 9 and some not as good. Another attempt was made after lunch to do some operating but with little luck, only one other station was contacted, GB4ARSE which was taking part in the British Inland Waterways Special Event. There were five Club members around today, some of whom are Instructors with the Air Cadets. They had a selection day for Gold Comms Badge course which will be held in the Autumn, and Maintenance weekend at the Station (fixing and checking equipment which had been used over the past year). The temporary aerial was soon erected and Dave G0KUC was of the mark contact Lighthouses on the Air Stations with a tally of around 14. He took a break part way through to join the RARARS net. Malcolm G7VRT had available a draft Certificate for comment. The Certificate once finished will be presented to operators using GB100RAF later in the year. A few adjustments were made and is now ready to go to the printers. Holiday time again five members in attendance with a few away on Holiday. Malcolm was on Holiday in Norfolk and had plans to visit Neatishead Radar Museum and the Special Event Station GB2RAF, on the 11th. However, plans did not work out as anticipated and he could not get along. He did visit Terry, the regular operator, at his QTH the following day. At the Club the aerial was erected after a quick cup of tea and Dave got down to business on the Radio. Firstly taking part in the RAFARS Net and it was noted that 3 Centenary Stations were on, Terry with GB2RAF AT Neatished, Bob with G0RAF at Newark Air Museum and of Course Dave at Halton with G1RAF. After the net closed contacts were made with stations in Morocco, Switzerland and notably R100WWS a Russian Special event Station marking 100 Years of Air Forces in Russia. After another successful day the Station closed at 17 00. Not so many today due to Holidays, Derf was down at the RAFA Club setting up for Sundays RAFA 100 luncheon. Mark and Jamie and tinkered with their teleprinters and took some bits way to refurbish. The Dave M5AGW sorted some of the Air cadet equipment which is being stored in the Club whilst Malcolm did a bit of unpacking and sorting of boxes from the recent move. Dave G0KUC joined the RAFARS Saturday net and spent time chatting to fellow RAFARS members. In the afternoon he tuned the bands and made contact with a dozen or so stations throughout Europe. A good turnout for the club considering it is holiday time. With 9 members present the morning started with tea and toast and a general chat. Dave G0KUC was congratulated for winning the RAFARS Christmas Contest using the Club Call. Encouraged by success various members talked about entering the RAFARS Constructors Competition and would work on their projects to have them ready in time for the AGM. Lastly, Dave produced a template for an operating timetable for the period 3 to 11 November 2018 and was asking for operators. Also the discussion looked at asking local RAFARS members if they would like to come to the Club and do some operating. Dave also suggested that we contact local Clubs to see if they would like to assist with some operating. Once the discussion was over the club members turned their attention to the various projects they were undertaking, Mark did some work on his teleprinters, Derf checked out a power supply for Roger and had to do a few minor adjustments on it. Dave and Dave put the 5RV up and started operating with Mark. They report that during the afternoon session they contacted several European Stations, one Brazilian and one Moroccan, on 20 metres. In addition they managed a Swiss Station on 18 MHz! The plan sales stand at the McMichael rally did not materialise due to other pressures on the club member. However, Nick and Malcolm ventured down to Reading and bumped into Mick another Club member. Passed the time of day with a mug of tea and a bacon roll and then had a look around. Nick came back with a few Microphones and some bits a pieces, Malcolm purchase was limited to four AAA batteries and a charger. Time was also spent talking to old friends including Stewart from VMARS. Dave did not operate today, expect he was World Cup maxed out. He received a very nice Certificate, number 54, from the organisers of Football 2018 Russia. The time was taken up by drinking tea, Dave talking about his exploits with Football Russia and a lot more tidying up. Derf has left some kitchen bits including a nice worktop in the Club Room and he hopes to fit this next week. Whilst Dave still driving in a call, through GB3TU, from G1RAF let him know that the club was already open which meant he didn't have to get the keys and more importantly "the kettle was already on"! Mick also asked if there was a spare cup as he was also not too far away. While enjoying the tea the team were soon joined by Mark and Nick. The G5RV was again erected by Dave and Roger who had also arrived on his two wheeled conveyance. Dave set about getting a few more FWC stations in the log (he said he would miss it next week.). Jamie also arrived and he joined Mark in teletypewriter mode. Nick carried on with his project and of course there were many discussions on numerous topics. Looks as though Nick may be joining VMARS in the near future. Derf had to shoot off to get the Jag's MOT sorted out but returned shortly after midday with a smile on his face. Anyway radio operations took a dramatic change of direction as after midday the bands were taken over by an international contest and these drowned out all the football stations. Nick also worked on his power supply project (for his 19 set) followed by sorting out his Pye loud hailers. Dave nearly had three heart attacks as he tested the sirens on them. On the radio front Dave continued look around on 80m as it seemed to be the quietest band with any activity. A contact with the French radio society HQ was followed by contacting the English RSGB HQ station. This was quickly followed by the Dutch HQ station and then the Belgium HQ station. “Hang on” he said “I am beginning to see a trend unfolding”. Even changing bands didn't affect the unfolding of events. To cut a long story short he managed to work 16 different countries HQ stations. Last one worked at 1720 as the aerial had to come down. All in all a good day 19 different countries worked, the furthest being Canada and three Russians. We even managed to work "Derf" on 5 different bands after he had gone home and adjusted his HF antenna. At last knockings, Malcolm called in via GB3TU, he and Dave had been helping on a Cadet Course near Heathrow together Two other Air Cadet Instructor members. Exchanged pleasantries and then contact was lost. A busy day, but again progress made. Derf says he is going to pop down in the week and start fitting the cupboards and worktop. The Club needs decide what we are going to do for GB100RAF in November as "Tempus Fugit" (grab you dictionaries). We need to decide what bands/modes we are going to operate and ask for volunteers for some CW operations, perhaps an advert via RAFARS? Also what kit is available and how many want to operate - our Cadet instructors and perhaps some of the successful cadets? Seven members of the Club turned up today, a good number considering England were playing in the world cup. This leads onto one of our contacts today. CQ918FWC in the Azores was a World Cup Station. All these were on 14 MHz but the band seemed a bit quite! This may or may not have been the change of aerial. The plan is next time to set the vertical up and a G5RV and do a comparison. Nick carried on with his project and the others did a bit more tidying up and moving of furniture. Malcolm sorted some tools and placed these in a couple of recently acquired tool boxes. Lastly the floor was given a good vacuum clean using the Vac which we had to strip down and clean last week. Now works like a gooden, no more clouds of dust and picks up well. All stations worked on 14MHz using Hustler vertical at 1m. Good reports received from all stations but band seemed quieter than usual, aerial or conditions? More comparison needed. Next project is to put up a proper tea bar and some shelving, a job for a quite weekday perhaps. The day started with a leisurely cup of tea and once refreshed the G4RV aerial was put up but not too much activity was found. Dave G0KUC, tried to show everyone the World cup certificates he had won during the month. This fell on deaf ears as all the other club members appear to be football philistine’s! Sorry Dave, all your hard work not appreciated. Derf measured up the "kitchen" area looking to acquire, or spend some of the club funds, on some cupboards and a work top to tidy things up. No kitchen area in the new room so some mess facilities be added on a self-help basis. Dave has been having trouble with his PS30 power supply getting a little warm. After taking the top cover off it could be seen that the fuse holder had been overheating but the fuse was fine, so Nick provided a replacement fuse holder from the depths of his van. Derf replaced this and after checking voltages found that the output was 16V; a bit too high? Anyway after reading the circuit diagram and the spec sheet it was found that this was actually correct without a load. Resistors were soon used to generate a load and it was found that the voltages were now what they should be. Still no confirmed reason for why it was getting too warm. Derf then disappeared, but returned with two computer fans which he soon engineered to attach to the rear of the power supply. Again it was switched on for over half an hour and didn't even feel warmer than room temperature. Time to take it home and try it under normal operations. Well done Derf and Nick, looks as though Dave owes you two a beer! Nick, Mick and Ben where discussing problems being encountered programming some "Hytek" radios which were switching off as soon as the programming lead was reconnected. No definite solutions but further investigation required. Nick then carried on with his project and Dave had to make at least one contact as we had put up the antenna, just a German portable station. However, a FWC station was heard trying to work the world. As no one liked football, Dave decided that he had better not try to break through the pile up, hi! The aerial was taken down at about 1600z and everyone headed home. Next week, all going well, will be setting up the mess area, Derf has been dispatched to get some kitchen base units and work top whilst Malcolm has acquired some shelving brackets to create additional space in the kitchen and operating area. The Club was on Air with GB4HTM representing the RAF Halton Trenchard Museum. Conditions were not to good and only a couple of contacts were made during the various other tasks going on. It did not help that there was also a Spanish Competition on. One success was a Brazilian Station. Jamie continued to do some work on the Teleprinters, measuring up the size of one of the connectors so he could make one up. Whilst Mark who was hoping to work on them as well could not get along due to his car breaking down on the way. Nick continued with his hand held radio project whilst Roger assisted Malcolm sorting some more boxes out which were left over from the move. Just a couple more to go. After a hard days sorting and arranging things in the club, some light at the end of the tunnel can now be seen. A few more weeks and things should be back to normal. Nick continues with the refurbishment of Hand Held radios for the Air Cadets and Dave has again been on the air with a few more stations in the log. Mark has been working on a switched mode power supply and has replace two power transistors but there is still another fault as these new transistors are running somewhat warm! back to the drawing board Mark. Time was also spent discussing plans for attending the Newbury Rally and taking part in the Museums on the Air event. After the customary tea, toast and marmalade a little more sorting out was started. Space was found on a couple of desk tops and Mark's large scope was put on top of one of the draw units. Amazingly after the desk tops had been cleared three teleprinters materialised out off the ether and placed themselves in the available space! The last few boxes were moved back up the Club meaning that we finally were able to reach the end wall - hooray. Chairs and boards were then repositioned; nearly ready to begin tuition or "presentations/lectures" any volunteers? Obviously still more sorting out required, but we are getting there. Next on the list of things to do is the repositioning of the big green worktop, sorting out the tea kitchen area, putting up the screen and organising the store room workbench area. After Jamie and Mark had to go Nick carried on with his project work and Dave couldn't resist the temptation to put up the temporary G5RV. Initially a call on the 80m RAFARS calling frequency generated an immediate response from G3LMO, thanks Nev , and several contacts including some RAFARS members were made. We were told that GB100RAF had been about earlier but sadly we missed them. A total of 17 contacts were made including a wireless museum in the Alps, a football World Cup station in Spain , a lightship in Antwerp harbour and a memorial station in Italy commemorating the Italian airship disaster in the Arctic . Again time to pull the antenna down, but all in all another enjoyable and successful day. The Club has registered for theInternational Museums on the Airand will represent the Trenchard Museum which is located here at RAF Halton. The Special Even Callsign GB4HTM (Halton Trenchard Museum) has been obtained from Offcom. The Club plans to be on air on Saturday 16th and 23rd June 2018. A damp start to the day but a lot milder than of late. Clubs members erected a G5RV and a long wire aerial and got wet feet from the long grass which has sprung up adjacent to the Club building. 7S6WX Swedish expedition to the " Weather Islands "
The Club has registered for the International Museums on the Air Special Event. A Special Event Callsign has been obtained for the occasion, GB4HTM (Halton Trenchard Museum). The Museum curator has agreed that we can set up a Station in the Museum. If all goes to plan we will have a Station up and running on the two Saturdays of the event. Members a little thin on the ground this week due to meetings and other commitments etc. Anyway the "few" of course started off with tea, toast and marmalade. Then a bit more sorting out and perhaps a little bit more carpet can be seen. Mark still looking for a bit of space for his teleprinters, but he is working on it and he enjoyed the marmalade! There is now space to reposition or green workbench but have decided to wait until after the equipment for storage and the rally gear were out of the way. Nick carried on assembling the charging stations for the cadet radios while Dave couldn't resist popping outside to put up the "temporary" G5RV. With the station now again operational Dave started looking for all those Life boat stations. Lots of GB stations but hang on a minute they are not lifeboats, they are Windmills on the air. After a break for more tea and biscuits, Nick changed projects and started repairing his "loud hailer" (should help him get out more), while Dave continued to do a bit more operating. The tally of stations worked at the end of the day was 10 windmills, 1 life boat, 1 military wireless museum, 1 cider house (pubs and clubs on the air - must find out more), 1 Italian Bell of Peace Memorial(IR3MD) and GB9RAF at Green Point Fort, an old listening station close to Belfast. Two members were away for a Meeting at RAFC Cranwell but both Malcolm G7VRT and Dave M5AGW found time to visit the RAF Waddington Club at their newly renovated Club room adjacent to the Pyewipe Inn, Lincoln. Bob G3VCA, gave an interesting presentation of the ins and outs of Vertical HF Aerials. The Waddington Club made the Halton Club Members most welcome. This weekend saw a small gang of members in attendance as again several were away on "other duties". Due to the weather being rather dismal, damp and gloomy it was decided that the temporary G5RV would remain warm and dry in the shack. Nick once again was continuing the building of the charging stations for the cadet radios and the “to do pile” is certainly getting smaller. Dave took the opportunity to instruct Jon in the connecting and setting up of a vhf/uhf station and also the preferred operating procedures, culminating in Jon speaking to Malcolm using the Club call while under supervision. If time had allowed the next progression would have been to put out a CQ call to see if we could attract any contacts from further afield but Jon had to shoot off just before lunch so this was put on hold. Perhaps the next CQ call will be on the agenda for next week and also repeater operations. Once again thanks go to Malcolm and his culinary expertise for lunch. The afternoon was again spent emptying a few more cardboard boxes and another few feet of visible carpet was the result. Future plans for taking part in Museums on the Air representing the Trenchard Museum, who share the same, were discussed. In addition setting up a radio station at RAF Halton Families Day was considered. RAFHRS members’ views would be welcomed and taken into consideration. Anyway, we must have been busy as no one opened the biscuit tin! This Saturday saw many of the Club members involved in teaching a radio course, at Silver Communicator Badge level for the Air Cadets. The syllabus of the course has been designed to integrate the foundation licence training and successful candidates may then apply for their licences. However this meant that the Club members had a good excuse to avoid the "sorting out" so this was put on hold for the weekend. During the morning the temporary G5RV was once again hastily erected, all be it at a height of only 10 feet above the ground. Dave took the opportunity to make contact with GB8MD, a special event station in Tywyn, celebrating Marconi day. This contact was then discussed in detail describing the radio procedures used, the vernacular and abbreviations etc. with two of our potential foundation licence holders, Roger and John. They agreed that this was much more "fun" than reading the books, hi! As they both had to leave before midday there was only time for a quick introduction to the wonders of QRZ.com. Hopefully they will soon be taking the microphone as part of the on air Foundation Licence Training. During the afternoon Nick continued with his project, currently assembling charging stations for the Cadet radios. Putting in the screws became a lot easier once he was loaned a drill of the right size for the pilot holes. Dave continued a leisurely look around the bands making contacts with a "scout" station in the Netherlands and an Italian special event from Marconi's house. Further listening found a German contest station calling CQ? Hang on that wasn't DB that was BD and it wasn't a German contest it was a China contest! Anyway a request from the members requesting a contact to show amateur operations to the cadets with the station they had put up took preference and good reports with the power turned almost off were received from at least 500 yards away. Perhaps it was time to see if the BD station was still there - yes they were and still 59+. Would it be possible to get through all the European stations calling? A little perseverance ( about 5 calls) and success; 59 HN from BD7DT received!!!!! It was quite amazing how many 59 001 reports they were getting. Not too sure what power or antenna they were using but a good 59 signal for over an hour slowly decreasing to 57 with a little QSB but still audible when it was time to turn off and take the aerial down for another week. 59 reports from 500 yards to 5000 miles not a bad day - just wait until we can get our aerials up "properly"!!!!!!!!!!! I don't know where we find all the time to drink the tea and eat all the biscuits. Another day working on getting the Club Room ship shape. Racking finally in place and secured. Shelves filling up fast. Roger and Jon made a start on putting up the notice boards, which is transforming boring walls into something more inviting. A couple have been set aside for Dave the operation manager and the plan is to put our interest QSL Cards up for all to see. Hopefully, this Saturday we will be able to get more boards up and a white board. There was even time for Dave to make a couple of contacts on the VHF/UHF Radio! First job today was to re-erect the temporary G5RV, after a cup of tea of course. We must be getting better as the first contact was made at1015; 22mins earlier than last Sunday. Spoke to the guys at RAF Wyton again and then joined the RAFARS net on 80m just before 1100 to give away the call and a few points. Hopefully this could become a little more regular when the aerials are a little more permanent. It was nice to hear that we seemed to be the only ones with sunshine! After the net the band appeared to be very noisy and so a little more sorting out was done. We will manage to find the carpet under all the cardboard boxes, hi. After Malcolm’s culinary delights for lunch, again a little more sorting out was done and Nick even managed to progress his project he is doing for the cadets. Checking around the bands contacts were made with good reports from North America and of course Russia. All in all another enjoyable day. Shame it is time to take the aerial down again. Today we had around 10 Club members turn up to assist and take a look at the Clubs involvement with the RAFARS RAF 100 celebrations and competition. Before they could start they had to put up the G5RV and an end fed antenna with an SG 230 Tuner. Once on Air a good start was made making contact with the other main RAF Stations taking part. In addition a lot of time was taken on CQ Calls inviting others to contact the Station G1RAF. The first few contacts were with Russian Stations but as conditions changed UK stations were contacted. All in all 60 contacts were made and the clubs operations manager is now in the process of preparing QSL Cards for dispatch as necessary. This was the first on air operation from our new Club Room. All managed to work around the unpacked boxes which came over to the new Room when moving out of the old one. What’s more, nearly all the items required for the day were found without too much looking. Club members will continue to pack all the kit and publications in readiness of the move. No time for operating as it is fullsteam ahead for the move. The plan is to be up and running by the 1 April ready for the RAFARS 100TH Contest. The club had a busy day today with 7 Club members 1 guest with a visitor last thing. It was bacon rolls at 09 00 then lots of activity, Derf, G8ZGK, put the finishing touches to his linear Drake L-4B amp project and had it running with 800 watts into a dummy load. Roger had his first lesson for the Foundation Licence with plans to do more in a couple of weeks’ time. Nick continued with the servicing of shed loads of Baofeng888 radios. Nick’s Guest Richard spent time listing to the HF bands and talking to the other club members. An opportunity arose to have a visit to the Trenchard Museum and 3 of the newer members, one an ex brat, went to the Museum to have a look around. A good turn out today, with 7 members on site, not bad for the holiday period. An opportunity was taken to blow the cob webs out of the FT 1000 and go searching for the Light Houses on the Air Stations. Conditions were OK of sorts and the team managed to contact 6 Light House Stations. Dave our new QSL Card manager Dave G0KUC is working on a QSL Card for the Club with one of the Halton Vulcan’s on the front. Hopefully we will be able to send cards very shortly. We are applying for membership of the RSGB to make things easier for the issue and receipt of Cards. For RAFARS members we plan to use the RAFARS Bureau. Another successful meeting. Dave G0KUC and Jamie 2E0DUU, using the Club Call G1RAF, were on Air for a while using the Yaesu FT 1000MP. Several contacts were made including one with Terry at the RAF Air Defence Radar Museum at Neatishead Norfolk, Callsign GB2RAF. Another busy Saturday meeting with several members discussing the use of repeaters and looking at the various systems. The Chairman Derf G8ZGK, was adding a UK power plug to his Drake Linear and doing some research on the net in readiness for a planned mod the power supply. In the workshop area Nick was servicing pile of hand held radios and when finished they will be made available to the Air Cadets.